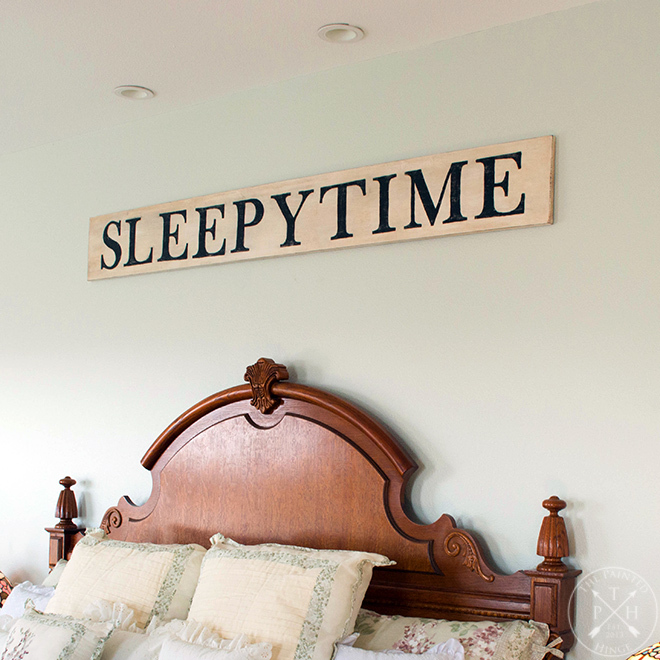 DIY Painted Wood Signs - Without Using Stencils! Hey Friends! 🙂 I love the look of painted signs using stencils! The problem is that I can’t find letter stencils that are big enough to make the size of letters I want to make. My only option is to by custom stencils (which can be costly) or buy a cutting machine and make my own stencils (even more costly). This is an alternative that takes a little more time, but saves a lot of money! All this really boils down to is creating and printing out letters, tracing them onto a wood board, and painting them in. It does take a little more time than using stencils, but it not hard to do at all. As long as you can paint in between the lines, you can do this! I am sharing the document I made to trace out this sign as a free printable – just click the link below to download it. It is in PDF format so everyone can download and use it. The font is Baskerville Old Face in 700pt. If you want to make this exact sign, you can just download and use it to save having to make it yourself in your word processer. If you want it in a different size or want a different word, just follow the directions below on how to make you own letters to trace. 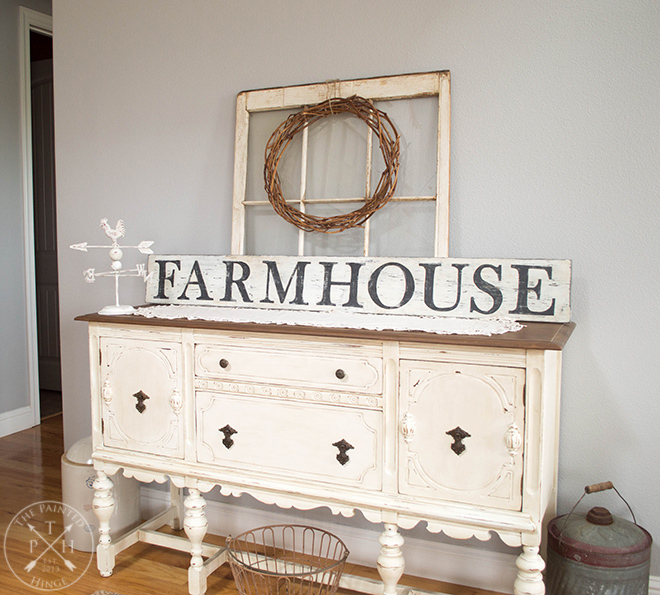 Want the letters to make a “Farmhouse” sign like the one below? 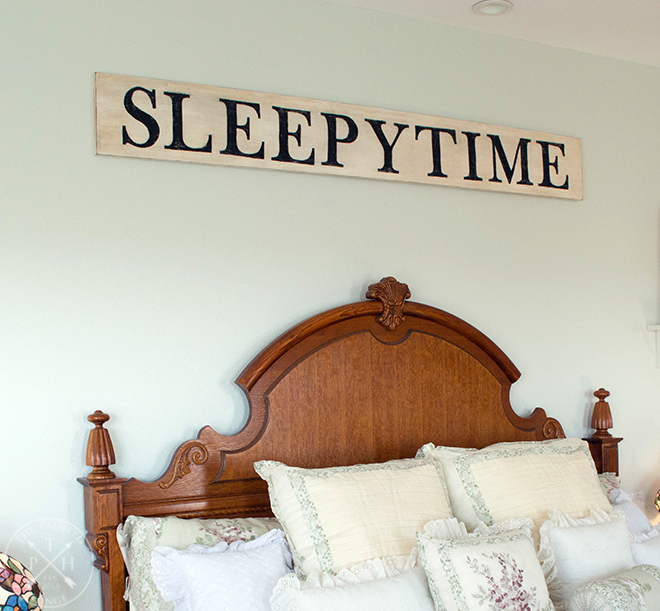 Then check out my post Free Printable Letters To Make A Farmhouse Sign! Now, on to the directions to create your own letters! First thing you need to do is get on your computer and open up your word processing software. I use Microsoft Word 2010, but you can use whichever one you have available to you. This next part is optional, but if you want to save on your printer ink, I recommend it. What you want to do is make an outline of the letters because that is what you’re going to do – trace the outline the letters onto the sign. The letters can get quite large depending on how big you want them (mine are 700pt), and if you print them out as solid letters, you are using a lot of ink that you don’t need to in order to do this project. The following directions on how to adjust the font to outline only is for Microsoft Word 2010. Open a new document in Word. On the home tab, select the little down arrow on the right side of the font color icon as shown below, and then select the white square for white colored font. If you now try to type anything onto the document, you will not see it, because the font is now white. Now you want to outline the font so you can see it again! Select the little down arrow on the right side of the font outline icon as shown below, then select “Outline”, then select the color of the outline (I used black). In the same window, select the size that you want the outline to be. I used 3pt, but you can make it whatever size you like. Once you make all the letters you need, print them out! (See the instructions below about sizing the font to the wood board before you do though.) Save the document if you think you will want to make another sign. You can reuse the letters you printed out as well. The wood board I used to make the sign is 1″ x 10″ x 6′. Now I know that I’m not going to make some people happy here, but fitting your letters to the size board you are using (or vice versa) is not an exact science. The questions you will want to ask yourself is how big do you want the sign to be, then how big you want the letters on that sign to be. Once you get that all figured out, measure out each letter using the ruler in your word processing software, figure out how much space you want between each letter, and add it all up to get a decent estimate if it’s going to fit the height and length board you’ve chosen for your sign before you print anything out. Sometimes, you may want a sign that is 6′ long, but the word(s) you want to put on the sign in the font size you want to use won’t fit. You will have to either make the font smaller or get a longer board. Once I get to the point that I am reasonably satisfied that the font size I chose is going to fit the board I chose, I print them all out and roughly arrange them on the board to see if I’m right. Once I get the font situation all figured out, I start working on the board. I like my signs to hang flush on the wall, so I have my hubby drill a keyhole hole that the hanging screws fit over. You will need a keyhole drill bit and guide in order to do this. You can use whatever hanging hardware you like best; I’m just sharing how I like to do it as a possible option. 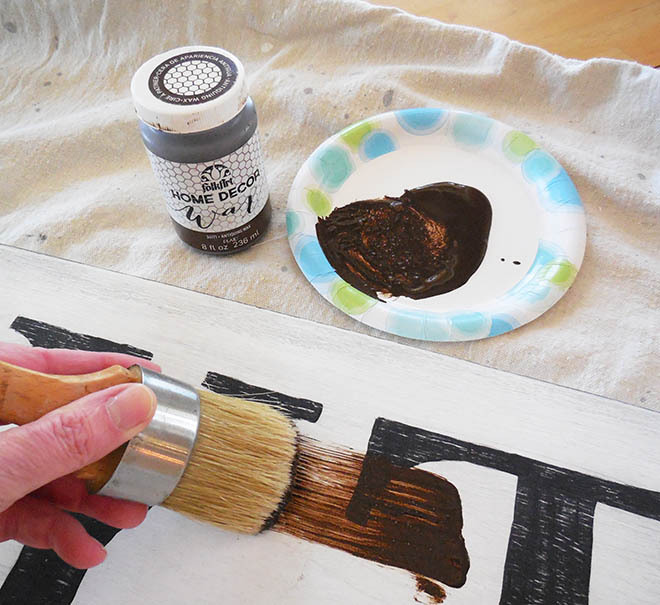 If you do use keyholes in your sign, make sure to do them before you start painting… I forgot to have my hubby drill the keyholes until I had the stain and one coat of paint on it, and when he gave it back to me, the paint was pretty dinged and scratched up from the process! Fortunately I intended to do two coats of paint on my sign, so the second coat covered all that up. Now it’s time to stain the wood. I used Varathane wood stain in Ebony (where to buy). I did two coats, painting each coat on using a brush, allowing it to set for a few minutes, then wiping off the excess with a clean lint-free cloth. I allowed it to dry thoroughly between coats. The wood stain has a strong smell to it so you will want to do this outside or in an open area like a shop, which is where I did it. This post contains Amazon affiliate links for your convenience to help you find the paint and supplies I used to make this project. I make a small commission if you order through my links, but it doesn’t cost you anything more! If you do, thank you! ? Once the stain was thoroughly dry, I put on two coats of paint, allowing each coat to dry thoroughly. 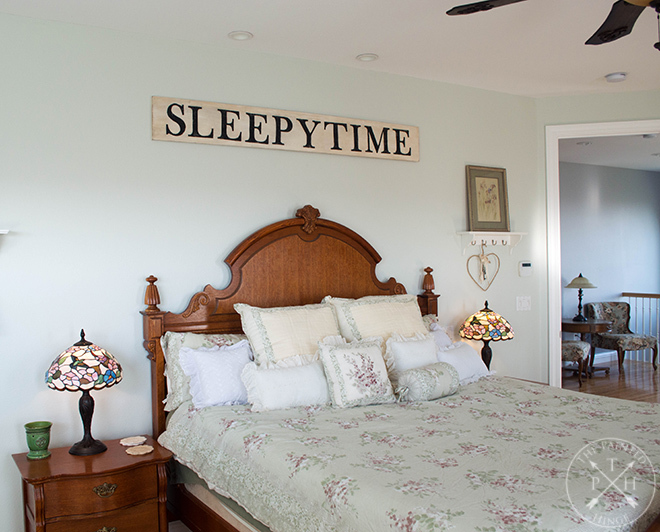 The paint I used Is FolkArt Home Decor chalk paint in White Adironack (where to buy). Now comes the fun part – the stenciling! Since this doesn’t use a lot of paint at once and I wanted to be warm and comfortable while working on it, I brought the sign into the house so I could work sitting at our breakfast table. In order to trace the letters onto the sign, you will need graphite paper. The graphite paper I used is Royal Brush Gray Graphite Paper (where to buy). It comes in white color as well for tracing on darker colored surfaces. I also got the Royal Brush Embossing and Styling Set (where to buy) to trace the stencils. Once you got the letters laid out and measured up, start tracing! Once you got all the letters stenciled on, you can start painting them in. I used FolkArt Home Decor Chalk Paint in Rich Black (where to buy). I just used an art paint brush to paint on the letters. Again, don’t worry about being perfect – you can always touch it up with more white paint, and once you distress the sign, you won’t see any minor mistakes anymore anyway. Now it’s time to distress the sign. You’ll want to take the sign outside because as you can see below, sanding the sign makes quite a mess! I used 150 grit sandpaper and sanded the face and edges of the sign. Once you’re done sanding, wipe everything off with a clean cloth, then go over it again gently with a clean damp cloth. Allow it to dry a bit before you put on the wax. You’re now ready for the finishing touches! 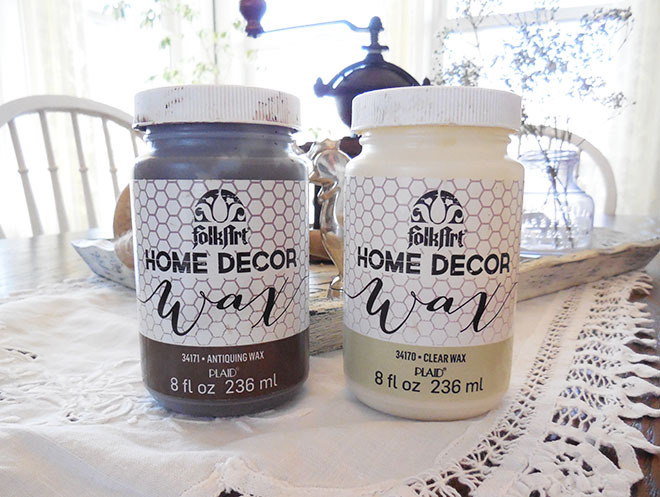 I used FolkArt Home Decor waxes in Antiquing (where to buy) and Clear (where to buy). Using the Antiquing wax is optional; I like how it makes the paint look older. Working in sections, apply the Antiqing wax with a wax brush, allow to sit for a minute, and wipe off the excess with a clean, damp, lint-free cloth. Let it dry for a couple of hours and then apply the Clear wax, working in sections and allowing it to sit for a few minutes before wiping the excess of with a clean, dry, lint-free cloth. 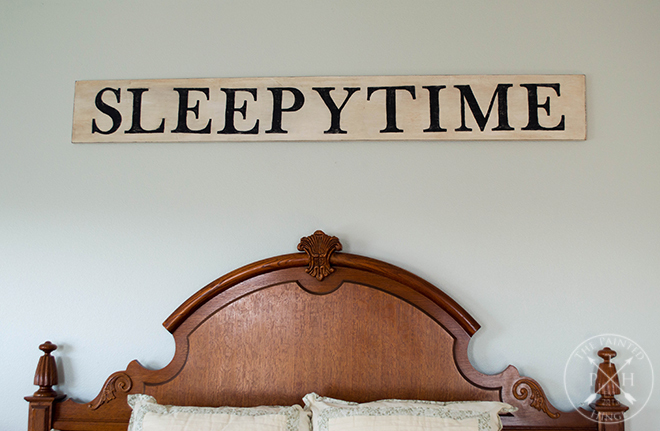 Allow your sign to dry thoroughly before hanging it up. I hope you enjoyed this tutorial and I hope you make a mess of these signs for yourself! 🙂 If you have any questions or comments, please leave them in the comments section below! Love the sign, Michelle! Great tutorial too. I learned a bit more about the sizing for the letters with the size of the wood. I tend to keep printing till I get it lol. We use good old fashioned carbon paper to trace the letters but I’m going to try the the graphite paper though. Thanks Lisa! I used to just print until I got it too 🙂 I like the graphite paper because it seems to transfer easier. I also like that I can get it in white, which works great for tranferring letters onto unpainted wood signs. Comes in white? You’ve sold me because sometimes the carbon ink smears and if not caught right away I’m screwed haha! I’m kind of new at this. Not painting & stenciling, but following someone else’s directions. I usually just wing it. But your site is great. 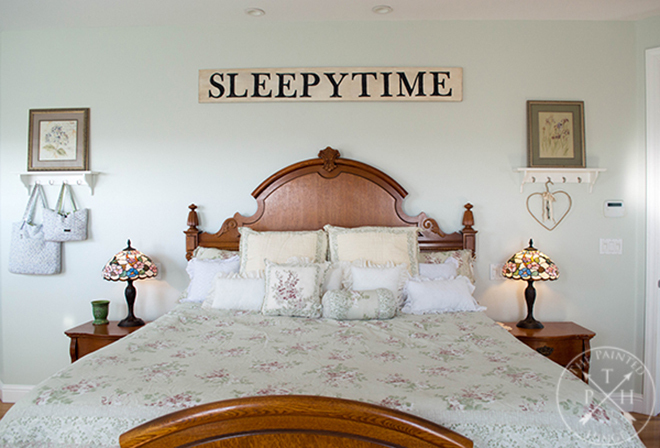 I will be making the Farmhouse sign & maybe the Sleepytime one for my guest room. Thanks for making this easy for anyone to do! Happy crafting!!!! Really cute! 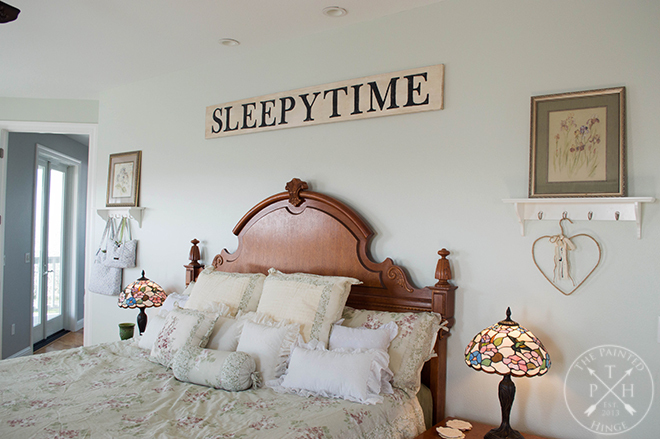 Great job on your sign !your bedroom looks warm and cozy !! This is a great DIY piece, thank you for the detailed explanation, including the painful Microsoft bit :). We’ve done one for our barn but we draw the letters ourselves – yours is definitely a better result. Love your sign Michelle. I did this once for a sign too and it is a great idea. I’m sorry if I’ve missed it – but does it matter what kind of wood you use? Michelle, This is a wonderful tutorial and one I’m sure to refer back to. I had no idea there was also a white graphite paper. Awesome! Pinned and Stumbled to share. Thank you, thank you for stopping by and sharing with us at Brag About It! Have a wonderful week! So cute! I love it and you make it look pretty easy. Thanks so much Joy! 🙂 And trust me, it is easy! Thanks for sharing at To Grandmas House we go link party. I love reading how other people make signs. I always learn something new. I am featuring this with tonights party post at Abbotts At Home dot com. Thanks so much for your help. I love the idea of painting signs but the first and last one I did for a friend I just got the wood from the lumber yard. I’m pretty sure it warped can you give me some ideas. Thanks for your help. Maybe I missed something, but why did you stain the board before you painted it? Seems like an unnecessary extra step. Hi Margie! The reason I stained it before I painted it is so when I distressed it, the darker stained wood would show through. This makes the distressed areas easier to see than if I didn’t stain it beforehand. If you aren’t going to distress the sign or don’t mind the lighter wood showing through, you can skip this step. A tip if you don’t have access to white graphite paper and you want to transfer an image to a dark surface: Rub a piece of chalk on the back of the image you want to transfer, then lay it on your surface, chalk side down. Trace your image as you normally do. When you’re finished, the image will be on your surface, in chalk. This is the best tutorial and the easiest i have seen .Thank you .Excited to do this project I also see this as being Christmas gifts .. Thank you so much. I have saved these. I am always doing projects for my family and know that I will definitely use them. Much appreciated. My question is, what size keyhole bit did you use as I’ve just had a quick look on Amazon and they come in different sizes so it’s a bit confusing and I don’t want to buy the wrong one. Girl, I’m doing it! I have everything all ready to go and can’t wait to have it hanging on my wall! Repainted my kitchen cabinets this past summer and something is just missing… This is the perfect project…..and of course being in the midst of the Christmas chaos is the perfect time to get crafty, right? Here I go….! Thanks for the inspiration! I’ll take a picture when I’m done! I handpaint signs here & there & I am having a hard time when I go to distress the powder must smear & ruins all my work. Makes me so mad! I use the chalk paint from Walmart if that matters. It’s more noticeable obviously with the light base & dark lettering. What the heck am I doing wrong?! I keep researching & coming up with nothing! Hi Melissa! I’m sorry you’re having trouble with this! When I distress the letters, the black powder from the distressed paint does get on the rest of the sign, but I’m able to clean most all of it off without a problem (and what remains just adds to the vintage look of sign). Since I’m not having the same problem, I can only assume it’s the paint you’re using. Maybe just distress around the letters instead? The letters won’t look as vintage, but at least you won’t have the mess. I hope that helps! I’m so happy to have found your site as I am very new to stenciling and sign-making and I can’t wait to try this out on my very first sign! Everything in your tutorial was so easy to understand (even the directions for printing letters)! I was wondering if you used regular printing paper, or if you have a recommendation. It was also extremely helpful to be able to know what and where to buy all the products you need. I’ll def let you know how it turns out! PS: My bed is almost exactly like to one in the picture! Hi Ellen! Thanks so much for all your great feedback! It’s always nice to hear that what I’m posting is making sense to my readers. Hi Michelle. 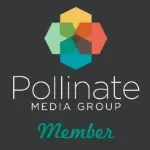 So glad I stumbled upon your site. Thanks for your straight-forward directions especially the white carbon paper that I didn’t know they made and info on the keyhole bit. Also, all the supportive links. I’m a fan. Keep up the good work. Happy crafting! My first visit to the Painted Hinge, I love, love your work! And thank you so much for sharing! I will be back! I’ve been looking everywhere and just can’t seem to find an answer to this so hoping you can help. Any time that I try to distress my painted letters, my wood ends up becoming the colour of the letters after standing it. I try letting it dry overnight, I’ve tried putting my Osmo oil on top and then sanding. No luck. Every single time. I also use the Folk art chalk paint. Both when my base is just stained or painted, the colour of the text will get “smudged” into the base stain or paint and look like crap. Any suggestions at all, would be greatly appreciated because I’m going bonkers here lol My latest project was stained underneath, I painted the letters white, let it sit overnight, tried to distress it and it made the stained part milky looking. Thanks so much! Hi Charlie, I’m sorry I didn’t get back to you sooner. It sounds like when you distress you might be doing it with too much force and sanding the darker paint into the lighter paint. This is just a guess as I haven’t had the same problem with the Folk Art paint. When you distress, try focusing just on the letters and don’t sand the lighter part of the sign at the same time. You should be able to remove any excess dark paint that is sanded off with a cloth – again using a light touch. If it still doesn’t come off, try dampening the cloth.